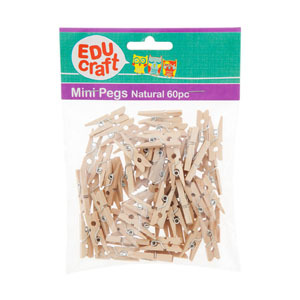 EDUcraft Mini Pegs can be used in many craft projects, as an embellishment or as a hanging solution. Made from wood, EDUcraft Mini Pegs are a natural colour and can be painted and decorated with stickers, beads, and glitter. Use a glue gun to stick them onto light weight projects, or hang them as wall decorations. For a unique initiation or card, use EDUcraft Mini Pegs instead of traditional paper fasteners or split pins.